Natures Aid Vitamin C Effervescent (Orange Flavour) contain 1000mg of Vitamin C. Vitamin C contributes to the normal function of the immune system and increases iron absorption. Free From: Artificial Flavours & Preservatives, Lactose, Yeast and Gluten. 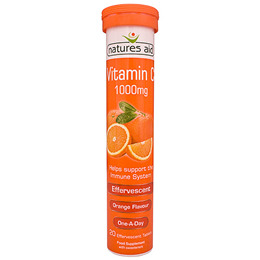 Below are reviews of Natures Aid Vitamin C (Orange Flavour) - 20 Tablets by bodykind customers. If you have tried this product we'd love to hear what you think so please leave a review. Good fizz good flavour, not too sweet just what I expect from an effervescent vit c tab.